Elusive and extremely shy, America's extraordinarily beautiful wildcat, the cougar, was called "the spirit of the mountains" by the Native Americans. Cougars pose very little threat to people, yet each year thousands are needlessly killed for sport. We're working to protect this keystone species. September 2018 - Since 1890, there have been only 25 confirmed fatal cougar attacks on people in all of North America—that's only 25 deaths in about 130 years—according to Dr. Paul Beier, recognized wildlife expert on cougar/human conflicts. While many states use lethal control methods to protect the public when cougars accidentally enter human-populated areas, California found a better way. Not only have they not allowed hunting of cougars in over 30 years, but they approved groundbreaking legislation that changed how they handle public safety issues. Does Killing Cougars Decrease Potential Conflicts with People and Livestock? North America is home to one of the world's most extraordinary and beautiful wild cats, the cougar. Majestic and mysterious, cougars are elusive and secretive by nature. Because of this, Native Americans referred to them as "the spirit of the mountains." Cougars' geographic range once spanned from northern British Columbia to Patagonia, and from the Atlantic to the Pacific coasts. Because of predator control and habitat loss their range has been diminished by about 50 percent, leaving them primarily inhabiting the western states. The chance of ever seeing a cougar, much less being attacked by one, is extremely remote. There has never been a documented cougar attack or fatality in Oregon's history, yet the Oregon Department of Fish and Wildlife calls for more cougar killing every year in the name of public safety. Also known as a mountain lion, panther, ghost cat, catamount and puma, the cougar's Latin name, felis concolor, means cat of one color. Adults are tawny brown with black-tips on their ears and their long tails. On average, females measure 7 feet from nose to tail and weigh between 70 and 100 pounds. Males may reach up to 8 feet in length and weigh between 130 and 150 pounds. Cougars can live in densely forested regions or in open sagebrush habitats. Their territories can range from 25 to 100 square miles and they have been known to travel 20 to 25 miles in a single day. Cougars thrive in habitats that provide a plentiful prey base. They are active mostly at dusk and dawn. Strong and swift, these powerful carnivores prefer deer and elk as their main source of food; however they may prey on smaller mammals, such as rabbits. They hunt by stalking their prey and ambushing or springing on it, as opposed to running it down like wolves. 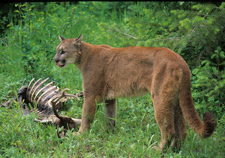 Cougars cache or hide their kills under brush, rocks or in thickets, and return to it to feed. Cougars are solitary animals, except during reproductive periods when they are looking for mates and breeding. As they have no fixed breeding season, kittens have been observed throughout the year. Gestation lasts three months and the female gives birth alone in a den. Her average litter size is two to three kittens, which she raises by herself. Male cougars will kill kittens they have not sired, as well as other cougars who move into their territory. Cougar kittens are covered with brown spots and have dark rings around their tails. These markings fade around six months of age. Sexual maturity is attained around age two to three. A cougar's average life span in the wild is approximately 8 to 12 years. Common causes of death are disease, people (hunters and trappers), bears, or other cougars. Another significant cause of death is being injured or killed while hunting prey. Deer and elk also pose a threat to cougars. Increasing hunting of cougars does not reduce their population size, but it does change the age structure by disrupting their social system. Cougars are dangerous to humans and pose a risk to those living or recreating in rural areas. Cougars are the most elusive and least aggressive of the world's large cats. They are afraid of people and do not recognize or seek us out as prey. They want to avoid you and not be seen. In fact, you are seen by cougars a lot more frequently than you see them. Cougar populations are exploding in Oregon and elsewhere, and must be controlled by hunting. Cougar populations are "self–regulating." They are controlled by prey/food availability. The real reason for this myth is to please/appease hunters who want to justify killing cougars because they compete with them for deer and elk. Increased hunting of cougars is needed to ensure public safety and livestock protection. Research in Washington, Arizona, Colorado, California and other states shows that sport hunting does not reduce the risk of cougar attack or conflicts. In fact, it may increase the slight risk of attack by selectively removing large trophy cats, usually dominant males, leaving unnatural numbers of juveniles, the age class associated with conflicts and attacks. Additionally, hunting takes place in remote wilderness areas, not in populated areas, so the cats that hunters kill are not the cats that might cause conflicts. Read what WSU experts have found about the effects of over-hunting. 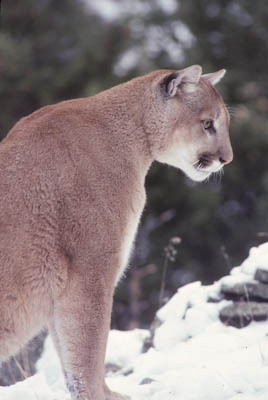 Cougars are decimating deer and elk populations and must be managed to protect prey species. Deer and elk populations are thriving throughout most of Oregon and other western states. Deer, elk and cougars have evolved together for millennia and depend on each other for healthy populations and habitat. Learn about the importance of predators. 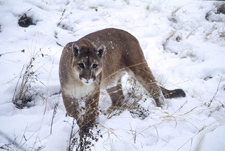 Researchers at Oregon State University (OSU) have galvanized the scientific community with their work demonstrating how critical predators and cougars are to the web of life. Hound hunting for sport was banned in Oregon in 1995. Since then the number of cougars killed in the state has more than doubled (see cougar mortality statistics). Hound hunting is allowed for public safety and to remove damage-causing cougars, it is only prohibited for use by trophy hunters. The livestock industry is suffering huge losses because of cougar killing sheep and cattle in Oregon. 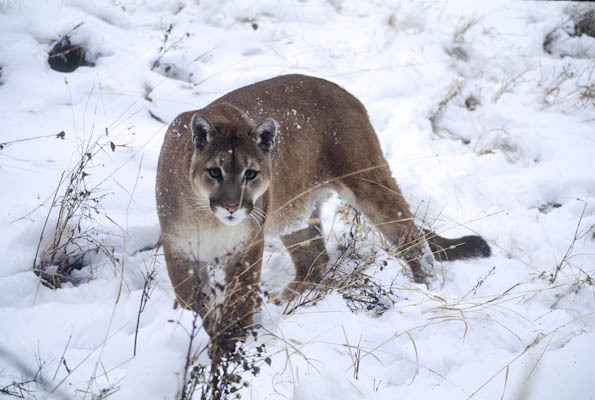 The Oregon Department of Agriculture survey on wildlife damage showed that out of the $1.5 million dollars in livestock losses due to wildlife predation in Oregon, only .2 percent could be attributed to cougars. Statewide, losses to wildlife total over $158 million dollars, mostly due to elk and deer damage. That damage could be minimized by encouraging cougar and other predator population growth. While cougars do not see humans as a menu item, they are cats! They will chase a moving target and may mistake small children and pets for prey. If confronted by a cougar, never run. Instead make yourself look big and hold small children close to your body. Give the cougar room to escape, back up slowly and stay facing the animal. Never corner a cougar, always give it an easy exit. Up until 1960, there was a bounty on cougars in Oregon and no restrictions on hunting them. 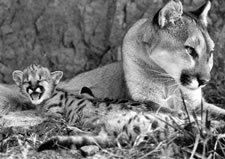 By the mid-1960's Oregon's cougar population was in serious decline and the big cats were practically eliminated from the state. In 1967 cougars were declared game animals, and restrictions on hunting were established which allowed the population to rebound. In 1994 Oregon voters banned the unethical practice of sport hunting cougars and bears with packs of dogs. Sport hunting used dogs to chase the big cats to exhaustion, making them easy targets for trophy hunters to shoot off tree limbs for sport. While this was forbidden, using hounds to remove cougars that caused damage to property or threatened public safety was never prohibited or restricted. As a result of these changes, tag sales increased from 500 tags to a whopping 50,000 plus tags sold in 2011. These changes in regulation—made legislatively, by Oregon lawmakers, and by the Fish and Wildlife Commission—more than doubled the state's cougar mortality rate in 17 years. In 1994 Oregon lost 204 cougars; in 2011 Oregon lost 502 cougars. The regulatory changes were accompanied by a well-planned and financed media campaign designed to convince the public that they were in danger from marauding cougars threatening their children and livestock. Every legislative session since 1994 bills continue to be introduced to gut or overturn the ban on trophy hunting cougars with dogs. And, remarkably, each session just before a scheduled bill hearing there is a cougar scare, usually in the form of a reported attack on a child. These alleged incidents make front page and prime time television when reported, but days later when proven to be a hoax (or a bobcat or house cat instead of a cougar), the facts are not reported. It is also important to note that the public is asked and directed to report all sightings of cougars to ODFW—and that all cougar complaints called in are recorded to justify the need to kill more cougars. 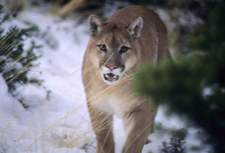 For insight on cougar sightings, read the opinion of Dr. Paul Beier, Ph.D., Northern Arizona University School of Forestry, who says reports of cougar sightings are worthless (or worse). By 2005 the hunting regulation changes and associated media scare tactics made to counteract the presumed cougar population explosion had already succeeded in increasing mortality levels to over 400 dead cats. That was still not enough to keep up with the inflated population estimates based on ODFW's flawed computer model, which by 2005 had cranked the population up to more than 5,000 cats. 2005 marked the time for the required five-year review of Oregon's Cougar Plan, and an opportunity for ODFW to address their inability to keep mortality rates up with the sky rocketing population estimates. Thus the infamous 2006 Cougar Management Plan was born. The pretext for the 2006 Plan was to increase public safety, although there has never been a documented cougar attack on a person in the state's history. But the single focus of the Plan was to kill more cougars. It contained no educational component and made no attempt to promote coexistence, to provide tools to improve livestock husbandry, or to better respond to legitimate damage or safety issues. Instead, the Plan set up "target areas" within which government agents can indiscriminately kill every cougar they can locate, using traps, snares, and packs of hounds. While the Plan involved a detailed description of the project, using scientific buzz words such as "adaptive management strategies," it is based on nothing more than solicited public complaint reports to determine where the killing areas are to be located, along with maximum kill levels extrapolated from a small study in Utah (made under very different conditions than are found in Oregon). The Plan was sent out for peer review to a very limited group of scientists. Predator Defense increased that field by sending it out to more scientists. The response to the peer review was spectacular. The best minds in cougar research condemned the methodology, from the population modeling to the use of unreliable complaint data as criteria for killing cougars. In short, the majority of reviewers agreed with our conclusion that the document defies and/or twists the findings of cougar research in order to justify killing more cougars and to keep Oregon's cougar population static (at an arbitrary level of 3,000 cats determined by a politically appointed body in 1994). The state's reaction to the peer review response was predictable, if unconscionable: it was ignored and no changes were made. Then in 2011 the Commission agreed to the ODFW's request to abolish the rule to review all management plans every five years. This leaves management plans for wildlife without oversight, regular review, or any need to keep up with and incorporate current research findings into the state's management strategies. Fortunately, one of the top cougar experts in the country, Dr. Robert Wielgus, had his say before the decision to ban reviews came to pass. Read "Top Cougar Biologist Weighs In." We wonder if the Plan will ever again be exposed to the light of scrutiny by the public or science, and if Oregon's cougars are destined to be continued to be slaughtered in the dark. Without required regular review, the 2006 Cougar Managment Plan remains in place into perpetuity. Predator Defense will continue to object, to seek out and obtain kill numbers for the record, and to make them and any other information we find available to the public. Proposals made for 2013 Big Game Regulations (see cougars on page 22) give no further pretense to the objective of the 2006 Plan by clearly stating the following: "Currently four target areas have been implemented to address declining ungulate populations." In other words, the government is killing natural predators so hunters will have a better chance to kill their prey, deer and elk, for sport. This exclusive focus on improving sport hunting conflicts with the stated purpose of the Plan, which is public safety. In his report on the Oregon Cougar Management Plan, Dr. Robert Wielgus, Director of the Large Carnivore Conservation Lab at Washington State University, asserted that the plan, adopted by the Oregon Fish and Wildlife Commission in April 2006, lacks any scientific credibility. He further contends that no valid scientific conclusions supporting the beneficial effects of administrative removal of cougars can be drawn from this study. No scientific evidence was presented showing that administrative removals achieved any of the stated goals (reduced complaints, livestock depredations, and increased number of elk calves). If you happen to see a news story in your area on cougars, also known as mountain lions, please contact the news agency and tell them about our media press kit on cougars, a video on our YouTube site which provides cougar facts and commentary from experts. We are developing a series of press kits, which will cover coyotes, wolves, black bears, and issues such as trapping and the USDA's Wildlife Services lethal predator control program. Overview: "He's One Cool Cat"
"For the animal shall not be measured by man. In a world older and more complete than ours, they move finished and complete, gifted with extensions and the senses we have lost or never attainted, living by voices we shall never hear. They are not brethren, they are not underlings, they are other nations."